LONDON Prime Minister Theresa May told her top team of ministers on Tuesday that talks with the Labour Party aimed at finding a way forward on Brexit were serious but difficult in some areas, her spokesman said. DUBLIN A temporary government shutdown with no end in sight, rising trade conflicts and a global growth slowdown: the first quarter outlook for the U.S. economy did not look promising at the turn of the year. LONDON British households reported the strongest growth in at least a decade in their earnings from work, a survey showed on Tuesday, suggesting that consumers and their spending can keep on supporting the economy during the Brexit crisis. London's FTSE 100 advanced on Tuesday as oil majors surged after the Unites States tightened sanctions on Iran, while tour operator Thomas Cook jumped after a report that bidders were interested in its assets. LONDON Sunny weather encouraged British shoppers onto the high street over Easter, with footfall across retail destinations rising 6.5 percent on Friday, 1.2 percent on Saturday and 8.4 percent on Monday morning, research company Springboard said. LONDON A top member of Prime Minister Theresa May's Conservative Party will tell her in the coming week that she must step down by the end of June or her lawmakers will try again to depose her, the Sunday Times reported, without citing sources. DUBLIN An influential U.S. congressman has warned the European Union that any Brexit arrangement that undermines Northern Ireland's 1998 peace agreement could endanger a proposed EU-U.S. trade deal, the Irish Times reported on Friday. BRUSSELS There is a still a concern that Britain may leave the European Union without a deal to smooth the way, the bloc's chief executive said on Saturday, urging Britain to take advantage of a six-month delay to work out the details of its departure. BELFAST U.S. House of Representatives Speaker Nancy Pelosi on Friday declined to comment on whether Congress might launch impeachment proceedings against President Donald Trump, saying it was not appropriate to criticise him while abroad. BERLIN Finance Minister Olaf Scholz ruled out taking on new debt to stimulate Germany's slowing economy and blamed anaemic growth this year on external factors like unresolved trade disputes and the risk of Britain leaving the European Union without a deal. 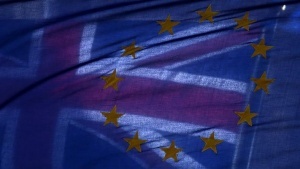 BRUSSELS/STRASBOURG A poll for the European Parliament showed that last-minute British participation in next month's elections to the European Union's legislature means eurosceptic groups will gain ground but pro-EU parties will keep a majority.